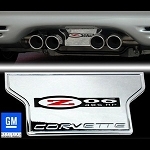 Dress up the rear end of your rare C5 Z06 Corvette with these unique stainless steel and acrylic C5 Corvette Z06 1997-2004 Exhaust Enhancer Plates. This is a factory authorized aftermarket enhancement, built of the finest stainless steel with an accurate acrylic design. The item ships complete with a specially formulated 3M high temperature adhesive tape, adhesive promoting pad, and mounting instructions.